The original "Tricks of the DOOM Gurus" contained everything you needed for the creation of your own add-on scenarios for id Software's games DOOM and DOOM II. 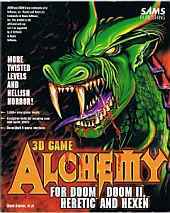 The fully revised (and retitled) second edition ("3-D Game Alchemy for DOOM, DOOM II, Heretic and Hexen") brings you even more! The technical content of the book has been extended to cover Raven Software's adaptations of the DOOM engine, Heretic and Hexen. The new edition covers everything from installing and running the games themselves, through designing and building your own add-on data files to hacking at the executable code itself. It provides the tools you need (on CD-ROM) together with full instructions for getting the most out of them. New since the first edition is a section on advanced DOOM editing and hacking techniques, providing unique insight into ways of mastering the mysteries of the greatest 3D game successes of all time.